Rowling: "Newt walks into a society he doesn't really understand." My heroes are always people who feel themselves to be set apart, stigmatized, or othered. That's at the heart of most of what I write. It's certainly at the heart of this movie. Her use of "set apart, stigmatized, or othered" is the first irony in the trailer. All three are very much the experience of Native peoples in the US. "Newt walks into a society he doesn't really understand." That is precisely what she's doing in the ways that she's appropriating from Native peoples for this story, set in a place she calls Ilvermorny, where she's borrowing, people say, from "Native American lore." Back in March when Rowling released her first story in Magic in North America, Native peoples responded to that first video, and the stories, too. I compiled them here: Native People Respond to Rowling. I wonder what we'll see in the movie? Several weeks ago, I was tagged in a Twitter conversation about William Grill's The Wolves of Currumpaw. The title rang a bell but I've not been able to recall why. Since then, I've had a chance to spend time with Grill's book. The Wolves of Currumpaw is a beautifully illustrated modern re-telling of Ernest Thompson Seton's epic wilderness drama Lobo, the King of Currumpaw, originally published in 1898. Set in the dying days of the old west, Seton's drama unfolds in the vast planes of New Mexico, at a time when man's relationship with nature was often marked by exploitations and misunderstanding. This is the first graphic adaptation of a massively influential piece of writing by one of the men who went on to form the Boy Scouts of America. The picture book is due out in the U.S. on July 12, 2016 from Flying Eye Books in London. It came out there in May. As the synopsis indicates, it is about Ernest Thompson Seton (founder of the Boy Scouts of America) and a wolf. 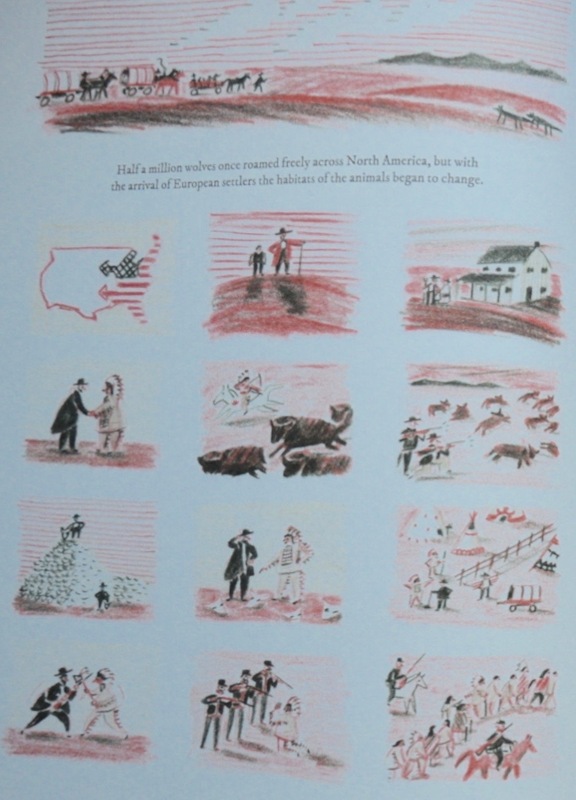 However, when I started to read the book, I was taken aback at two things: the illustrations of Native peoples, and, the absence of them from the text itself. The first words of the book set its time and place: "The Old West, New Mexico, 1862." The illustration shows an empty expanse of trees and in the distance, some mountains. New Mexico became a territory of the United States in 1848. By 1851, there were over 1000 US soldiers in the territory. Later in The Wolves of Currumpaw, we learn that the story itself is set in Clayton, New Mexico, which is located in the northeast corner of the state. That means it was in the area of the country that was the homelands for Plains tribes like the Comanches, Cheyennes, or Kiowas. Half a million wolves once roamed freely across North America, but with the arrival of European settlers the habitats of the animals began to change. These were the dying days of the old west and the fate of wolves was sealed in it. See? No mention of Native peoples for whom that area was their homelands. How convenient. Most people, by default, use "settlers" to describe those people. That word is seen, by some, as neutral. Others use "invaders" or "occupiers" or "squatters" to call our attention to the political and imperialism that was going on. 1. The US flag is shown as moving from the East Coast across to the West Coast. That's a graphic depiction of Manifest Destiny. I think white people were using the Santa Fe Trail to move to New Mexico. One problem with that depiction of the movement of white people is that it obscures history and the actual movements of Europeans into the southwest. The Spanish invaders were in the southwest long before the 1800s. 2. A white man in a red coat, and his child, are scoping out the land, deciding where to put their house. We don't know where that house is located, specifically. Somewhere near Clayton, New Mexico, but where? And what is the history of that particular land and who it belonged to at that moment in time? Since this book is, ultimately, about wolves, I guess we're not expected to ask those questions. That is not what the book is about, I imagine people saying. Those who put forth that response think I, and others who raise such questions, have "an agenda" as if they, themselves, don't! They do. Their push back is evidence of their agenda. 3. The white man's home is finished. 4. A white man in a black coat, shaking hands with an Indian man. Why? Did they, just at that moment in the story, meet?! Are they saying hello to each other? We don't know. Because we don't have enough information, I'm using "Indian" to describe the man. If Grill was being tribally specific, he might have told us the man's tribal nation. But again--this book is not about Indians, so, to Grill and those who read it as such, I'm probably asking an annoying question. 5. An Indian man on horse, hunting buffalo. 6. White men with rifles, killing many buffalo. 7. White men proud of how many buffalo they have killed. The illustration of the man standing on a huge pile of buffalo skulls is based on a famous photograph dated 1892. Here they are, side by side. 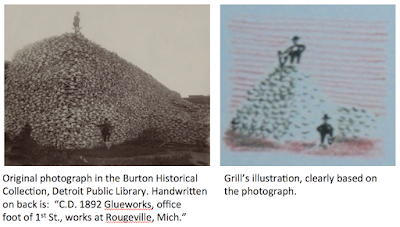 On the left is the original photograph, housed in the Burton Historical Collection at the Detroit Public Library. A handwritten note on back says "C.D. 1892 Glueworks, office foot of 1st St., works at Rougeville, Mich."
"[A]s long as Buffalo are up on the Republican the Indians will go there. I think it would be wise to invite all the sportsmen of England and America there this fall for a Grand Buffalo hunt, and make one grand sweep of them all. Until the Buffalo and consequent[ly] Indians are out [from between] the Roads we will have collisions and trouble" (Smits, 1994). 8. An Indian man points to buffalo skulls on the ground. We can interpret that to mean he's giving the white man heck for his role in the slaughters. Without a doubt, Native peoples objected to what white people did, but Grill's telling of history is a wreck. What happens in the next few illustrations is deeply disturbing. 9. White men build fence right through Indian tipis. The Indian man appears to be saying "stop" to the white man. 10. The white man and the Indian man fight. 11. The Indian man, on his knees, appears to either pray or plead with three U.S. soldiers as they level their rifles at him. 12. Indians being led away. It is hard for me to come up with words to describe #11. I wonder how Grill came up with that particular illustration? What did he read? Why did he think an illustration like that ought to be part of the story he tells? Did his editor ask him about it? What did he say? It is, of course, a brutally violent image. And while that sort of thing did happen, historically, it does strike me as the sort of thing that most people would deem as being inappropriate for seven year old readers (the book is marked as being for children aged 7 - 14 years). But it isn't noted in the review from Publisher's Weekly or from Kirkus either. Did they notice it? No mention of Native peoples in that sentence, and no reference to Native peoples in the set of illustrations below that sentence either. From there, the story moves to how the white people's livestock is being killed by wolves, and so, the wolves are killed. Old Lobo, or the King, as the natives called him, was the great leader of a notorious pack of grey wolves. On the next page, Grill gives us names for the wolves (Lobo, Grey Wolf, and Blanca) and white people (Seton, LaLoche, Tannery, and Calone). But, no tribal or personal names. Overall, we're meant to admire how smart Lobo is, and we're meant to be troubled by what Seton does in his effort to kill Lobo. It is gruesome in parts, and, his use of Lobo's mate (Blanca) as a lure is unsettling. In the end, Lobo dies in captivity. Again, I wonder about the book and its use with young children. The final chapter is about Seton's turning about. Full of regret he becomes a key figure in protecting wolves and other wildlife. In 1902, he founded the Woodcraft Indians. I truly do not understand the thinking behind this story. It is gratuitous in its violence. If the point is to understand a man's turning point, do we really need page after page about the things he did to try to kill this wolf? Some of it is meant to tell us the wolf was cunning, but the bulk of The Wolves of Currumpaw is about trying to capture that wolf. That image of the three soldiers with rifles pointed at the Indian man... that, too, is gratuitous. The history is wrong, the story us needlessly violent, and as such, I can't recommend The Wolves of Currumpaw. And I do not understand why Publisher's Weekly gave it a starred review. This review feels ragged as I read and re-read it. I may be back to polish it, but my inability to get to a place where I feel it is ready to share is an indicator of how messed up it is. Smits, David D. The Frontier Army and the Destruction of the Buffalo: 1865-1883. In The Western Historical Quarterly, Vol 25 #3, Autumn, 1994, pp. 312-338.